Adopting the language of movies, the show begins by drawing attention to “the set,” said Christine Schwartz Hartley in Sotheby’sMagazine. 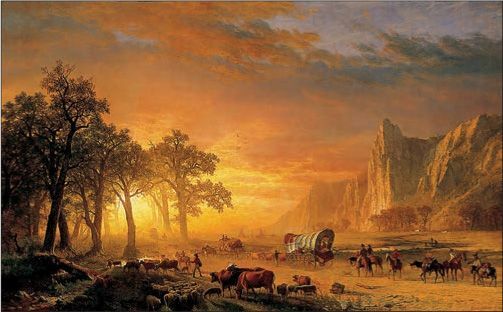 Albert Bierstadt’s Emigrants Crossing the Plains, from 1867, presents a grand panorama of a wagon train heading toward sunlight along the Oregon Trail. The image “powerfully conveys” how much hope was being invested in the West by a nation exhausted by civil war. “But the Western has also long reached beyond the U.S.,” which becomes clear when the exhibition turns to the prototypical cowboys and Indians who inhabited that set and who found a ready audience in Europe with Buffalo Bill’s touring Wild West shows. The Western, in fact, starts to look like “the major artistic export from America,” said Sonya Ellingboe in the Centennial, Colo., Citizen. It couldn’t fail to become a genre that would be reinterpreted over and over, whether in the spaghetti Westerns of Italian director Sergio Leone or the tongue-in-cheek contemporary art of Toronto’s Kent Monkman.